As the home of Germany's oldest university and the spot with the country's warmest climate, Heidelberg is a magnet for students and is a very popular tourist destination. 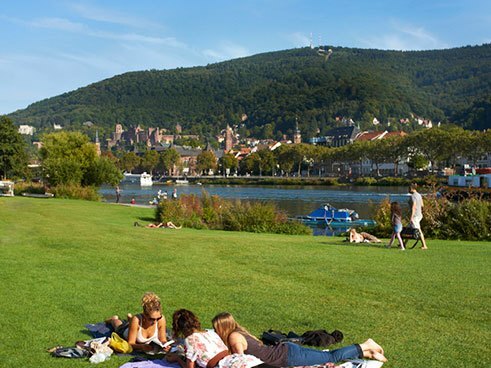 It has a population of about 150,000 and is situated in an idyllic spot on the banks of the Neckar River. Overlooking the city and affording spectacular views of the historic town center and the surrounding countryside is the landmark Heidelberg Castle on the northern slope of the Königsstuhl. 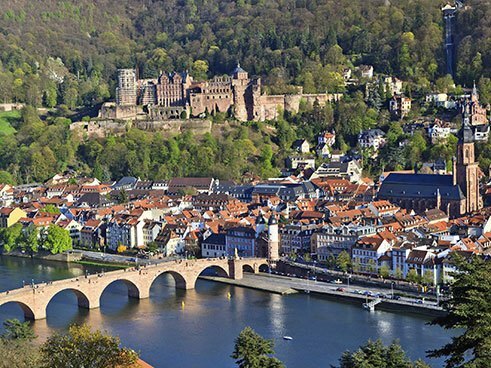 Heidelberg is one of the most famous university cities and, with colleges for church music and for Jewish studies, it is also home to two highly specialized institutes for higher learning. The Ruprecht-Karls-Universität was founded in 1386 and is highly respected in particular for its medical school. Under the German Excellence Initiative, it has been designated an elite university. It has about 30,000 students and is home to Germany's oldest university library. The university's outstanding reputation attracts both students and researchers from all over the world. Together with the university hospital it is the city's biggest employer. The numerous research facilities are dedicated above all to medical biotechnology. The German Cancer Research Center is among the leading institutions in its field worldwide. The economy of the Rhine-Neckar metropolitan area, which includes the neighboring cities of Mannheim and Ludwigshafen as well as Heidelberg, is shaped by such major companies as Heidelberger Druckmaschinen, the global market leader for printing machinery, the software house SAP and BASF, the world's largest chemical producer. Although Heidelberg is not renowned for museums and theaters and cannot boast well-known institutions, there is certainly no lack of culture. The many options include concerts in every genre, festivals, comedy clubs, talks, dance performances and plays. The old castle above the city is the site of the Heidelberg Schlossfestspiele, an open-air theater festival. Three times every summer the castle ruins are spectacularly illuminated, followed by a fireworks display. Heidelberg has about 20 museums, art collections and exhibition spaces. The history of the city and the surrounding region is brought to life in the Palatinate Museum of the City of Heidelberg, located in the baroque Morass Palace in the old town center. 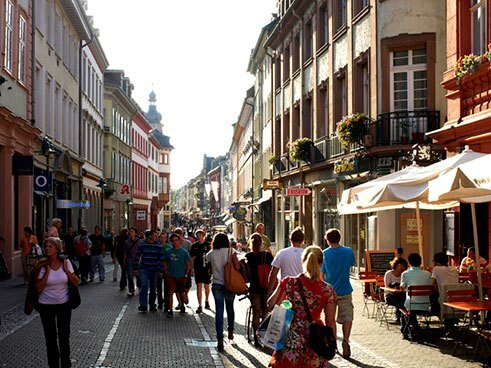 In a nation-wide survey from 2010, Heidelberg ranked among Germany's most creative cities, especially for literature, architecture and design. In the narrow lanes of the old town, perfectly preserved baroque buildings are situated amid countless cafés, bars and restaurants. A favorite spot for students between summer lectures is the courtyard of the Marstall building, where the university canteen is located. Philosophers' Walk affords the best view of the historic center with its church towers, the Neckar River and the castle. The Theodor Heuss Bridge leads the way out of the old town and into the greenery: The largest green space in the city is the Neckarwiese. In warm weather it draws crowds of locals to enjoy sports, picnics and barbecues or just to soak up some sun. For more nature and culture, visitors can make day trips on the German Wine Route, to the Roman site in Ladenburg, the forested hills of Odenwald, the Königsstuhl or take a drive through the Neckar valley.